Shadow Mountain is the winner of the Four Way Books Intro Series in Poetry, selected by acclaimed poet Kimiko Hahn. The first years of the 21st century have been marked by a global uneasiness over untold stories: forgotten prisoners, unjustified wars, secret decisions. In Shadow Mountain Claire Kageyama-Ramakrishnan gives voice to older, too-easily forgotten tragedies, urging us to learn a present lesson. She draws on the stories of Japanese-Americans interned at Manzanar Relocation Center, California, and on her own childhood and memories of her grandparents, examining the fault-line between family life and communal experience. 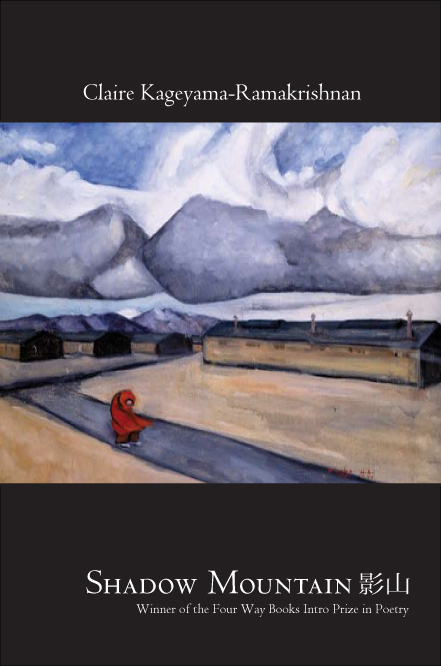 Shadow Mountain is captivating in its imagery, enchanting in its sounds, and a must read for anyone interested in the history of Japanese-American citizens and their children. Ranging in her forms from sonnet to terzanelle to fragmented, obstructed free verse, Kageyama-Ramakrishnan is a heartfelt interlocutor.